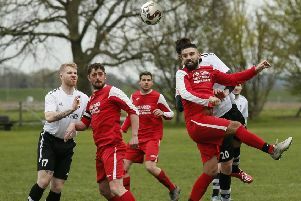 Bedford Town’s stopstart beginning to the Southern League Division One Central season continued with a 1-0 defeat at Royston Town on Saturday. With the match rescheduled due to both sides going out of the FA Cup, Eagles handed an immediate debut to new goalkeeper Ollie Sutton, son of ex-Norwich and Blackburn striker Chris. The visitors began in tigerish fashion, as skipper Luke Knight was booked for a bad foul on Josh Castiglione. The home player picked himself up to go close, seeing his shot blocked, but there was no stopping Kaan Fehmi on 22 minutes, as he lobbed Sutton to make it 1-0. Simon Thomas’ goal was ruled out for offside, while Bedford looked for an equaliser, with Phil Draycott’s 20-yard free kick well saved by Joe Welch, who then produced a superb close range block from Knight’s point blank header. Adam Watkins fired over the bar, and in the second period, Thomas had a great chance to extend the lead on 65 minutes as he was put through but gave the Eagles time to recover and with the presence of Sutton, was forced away from goal. Sam Baffour was close to a leveller, only to see Crows stopper Welch make another impressive save, while Sutton tipped a deep free kick on to the post and away. Eagles almost fell further behind when good pressure from Cohen at the other end saw a Sutton clearance hit him and spin just wide of the exposed net. Bedford pressed again to get something out of the game and thought they had done so with five minutes to go, only for Welch to somehow divert Knight’s goalbound header wide. The visitors then had another glorious chance in stoppage time, as sub Josh Bamford’s cross was missed Welch, only for George Boland’s glancing header to miss the target. Eagles travel to Aylesbury United on Saturday. Eagles: Ollie Sutton, Devante Stanley, Hammed Lawal, Tommy Hull, James Peters, Luke Knight (C), Sam Baffour (Josh Bamford 74), Adam Watkins, Ben Farrell (Jemal McKenzie-Lowe 66), Lee Roache, Phil Draycott (George Boland 81). Subs not used: Chris Cordora-Soanes, Ashley Harris.